According to CLIA, cruise travel is becoming the vacation of choice around the world, quickly outpacing land-based holidays. In fact, the research from the United Nations World Tourism Organization (UNWTO) covering 10 years from 2004 to 2014, notes global cruise vacations have grown faster in popularity than global land-based trips by 23%. In its annual State of the Cruise Industry Outlook CLIA says that the industry shows no signs of slowing down with 24m passengers expected to sail in 2016, up from 23m in 2015. Cruise Vacation Variety: Over the past 15 years, cruise vacation options have continued to evolve. Ranging from family cruises complete with kid-friendly brand experiences to high-end pampering at world-class spas, there’s a cruise experience for every travel desire. Value for Money: Cruise travellers state the “Return on Experience” offered by a cruise vacation is better than other vacation options. In addition to meals, accommodations and on-board activities that are typically included in the price, cruises also allow holidaymakers to see multiple destinations in one trip, and for one cost. On the River and Beyond: River cruising is experiencing a big boost in cruise popularity and allowing travellers to reach inland destinations that were never thought possible. A Tailored Trip: Cruises offer each traveller the chance to customize a trip specifically to personal preferences. Whether guests are hoping to relax by the pool or explore ancient ruins, there’s a cruise and itinerary available. Cruise to Every Corner of the Globe: Cruising not only allows travellers to visit to multiple destinations but also makes touring foreign countries accessible and less intimidating. A cruise can take you to foreign lands without the worry of navigating airports, restaurants or tourist sites. Never a Dull Moment: Many cruise lines offer a variety of on-board activities to keep everyone entertained, day or night, as they travel from port to port. From simulated surfing and sky diving to wine and chocolate tastings, the offerings are diverse and abundant. Multi-Generational Cruising: It’s hard to please all when it comes to vacationing, but cruising is designed to appeal to every age from toddlers to seniors. From family reunions to the family vacation of a lifetime, cruise experiences are the perfect multigenerational travel solution. Staying Connected at Sea: While many like the appeal of being disconnected while on vacation, there are those that want or need to be connected while at sea. Today’s cruises offer a myriad of wi-fi, on-board texting and data options. A Healthier Vacation: With a growing emphasis on health and well-being, cruising offers a wide variety of health benefits. From the purity of ocean air to on-board fitness options, there is a way for everyone to stay healthy in both mind and body while on a cruise. Three years in planning, the launch of Scenic Eclipse, was hardly a surprise but not what was expected. Over the last 30 years Scenic has built up an enviable reputation as a top end tour operator with its high quality river cruise fleet. In 2014 it very successfully added Emerald Cruises, a 4-star plus river product, innovative with an indoor swimming pool, convertible to a cinema in the evening offering outstanding sound quality. Rumours of a sea-going product were market talk, but where would Scenic position itself? The announcement, at London’s world famous Ivy restaurant, surprised many. 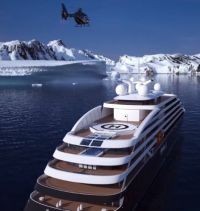 Scenic has come in with a mega yacht designed for just 228 guests featuring all-veranda suites, ranging in size from a very generous 32sqm Veranda Suite to the truly luxurious 233sqm two-bedroom Owner’s Penthouse Suite. Scenic claim "Real luxury at affordable prices." It is about the same size as Silversea’s Silver Wind (16,500 tons), but that ship accommodates 300 passengers. 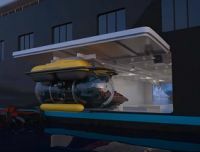 Eclipse is the first cruise ship, if one can use that term, to offer an on-board helicopter, plus a seven-place submarine. What is surprising for a small ship (it is just 540 ft long) is a wealth of public space including six on board dining options – contemporary fine dining with French cuisine, Pan Asian, Italian and steak to casual al-fresco dining on the Pool Deck or in the Ocean Café Lounge. She also features a 450sqm spa with an extensive menu of luxury treatments, indoor and outdoor Jacuzzis and plunge pools. A well-equipped gym with a separate yoga and Pilates studio complements the wellness aspect. The yacht offers Scenic’s all-inclusive luxury product with no bar bill, complimentary wi-fi, expert local guides for included shore excursions, butler service with an almost 1:1 guest-to-staff ratio and on board entertainment and lectures in the 240-seat theatre. As with all Scenic cruises, all tips and gratuities are included. Zodiacs and kayaks will also be available plus scuba diving and snorkelling equipment. Whether the electric bikes are coming on board remains to be seen but 2018 is a long way away. 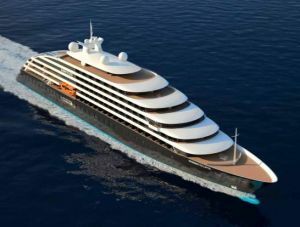 On the technical side Scenic Eclipse has been designed by a collaboration of internal and external naval architects including Foreship in Finland and is being built in Croatia. There is the option for a second ship to be delivered in June 2019. She will utilise innovative zero speed stabiliser fins, 50% larger than standard to provide even greater stability. Scenic Eclipse will have the highest passenger ship ice class rating – Polar Class 6 (Ice Class 1A Super), providing an added element of safety for guests. For Arctic and Antarctica cruises, passenger numbers will be limited to 200. No crowding for landings. The epitome of American post-war innovation and design, the ss United States was launched in 1952 and captured the Atlantic Blue Ribbon for a passenger ship on her maiden voyage – a record to this day. Ambrose lighthouse New York to Bishop Rock Isles of Scilly 2,942 nm (3,385 miles) in 3 days, 10 hours 40 minutes. Before her retirement in 1969, the SS United States vied with the Queen Elizabeth, Queen Mary and France as the most glamorous ship at sea. She transported four US presidents, international royalty, many of Hollywood’s ‘golden era’ celebrities, as well as a million passengers. While captivating travellers with features and elegance, the ship’s origin was equally intriguing. She was designed as part of a top-secret Pentagon programme during the Cold War, which stipulated it could be quickly converted from a luxury liner into a naval troopship in the event of a war, carrying 15,000 troops with a 240,000 shaft horsepower propulsion plant capable of travelling 10,000 nautical miles – almost half way around the globe – without refuelling. Sad to say her time since decommissioning has been less glamorous, the ship since 1996 berthed at Pier 84 Philadelphia, across the river from another glamourous lady of a bygone era, USS New Jersey, a Second World War battleship, in pristine condition and open to the public. Gross tonnage is similar 53,000 United States (990ft x 101ft), New Jersey 58,000 (887ft x 108ft). For the last 20 years enthusiasts have struggled to save the ship from the scrapyard and resurrect her in some way. Together with the SS United States Conservancy, Crystal Cruises has announced it will save ‘America’s Flagship’ and embark on the enormous undertaking of bringing the ship into compliance with the latest standards, and returning her to oceangoing service. Crystal also committed to covering all costs associated with preserving the ship while undertaking a technical feasibility study, which is expected to be completed by the end of 2016. “The prospect of revitalising the SS United States and re-establishing her as ‘America’s Flagship’ once again is a thrilling one. It will be a very challenging undertaking, but we are determined to apply the dedication and innovation that has always been the ship’s hallmark,” says Edie Rodriguez, president and CEO of Crystal. The modern United States by Crystal Cruises will be transformed into an 800-guest-capacity vessel, featuring 400 luxurious suites with dining, entertainment, spa and other luxury guest amenities that are true to the ship’s storied history. 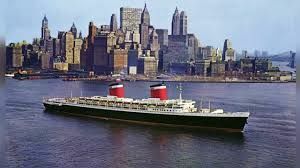 Features of the original SS United States such as the Promenade and Navajo Lounge will be retained, while new engines and sophisticated marine technology will be installed to maintain her title as the fastest cruise vessel in the world. Crystal Cruises will be examining exciting new itineraries for the liner including not only the traditional transatlantic voyages from New York City, but from key US ports as well as international voyages around the globe which are a signature offering of Crystal and part of the line’s ‘World Cruise’. The third and least likely 2018 event is Titanic 2 a project that the already mentioned Mr Palmer has been working on for some years and but has had his attention diverted by his Jurassic Park-inspired dinosaur theme park which closed in 2015 nearly two years after it opened. His company, Blue Star Lines, has issued some fine artists’ impressions. She will also be around 50,000 tons, very slightly larger than its ill-fated namesake. 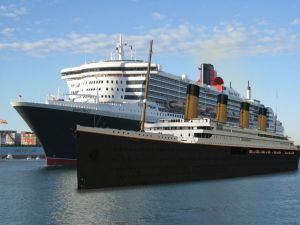 Titanic 2 will be built in compliance with the latest ship regulations and technology, while some features will be replicated for historical significance and not functional purposes.